FOR thousands of years, people have sought substances that they hoped would boost their mental powers and their stamina. Leaves, roots and fruit have been chewed, brewed and smoked in a quest to expand the mind. That search continues today, with the difference only that the shamans work in pharmaceutical laboratories rather than forests. If asked why, the shamans reply that they are looking for drugs to treat the effects of Alzheimer’s disease, attention-deficit disorder, strokes, and the dementias associated with Parkinson’s disease and schizophrenia—and that is the truth. But by creating compounds that benefit the sick, they are offering a mental boost to the healthy, too. Provigil and Ritalin really do enhance cognition in healthy people. Provigil, for example, adds the ability to remember an extra digit or so to an individual’s working memory (most people can hold seven random digits in their memory, but have difficulty with eight). It also improves people’s performance in tests of their ability to plan. Because of such positive effects on normal people, says the report, there is growing use of these drugs to stave off fatigue, help shift-workers, boost exam performance and aid recovery from the effects of long-distance flights. Earlier this year, Nature, one of the world’s leading scientific journals, carried out an informal survey of its (mostly scientific) readers. One in five of the 1,400 people who responded said they had taken Ritalin, Provigil or beta blockers (drugs that can have an anti-anxiety effect) for non-medical reasons. They used them to stimulate focus, concentration or memory. Of that one in five, 62% had taken Ritalin and 44% Provigil. Most users had somehow obtained their drugs on prescription or else bought them over the internet. There are a number of approaches to cognition enhancement. One of them, according to Trevor Robbins, a colleague of Sir Gabriel’s at Cambridge and another member of the working group, is to activate the brain’s “off” and “on” switches. 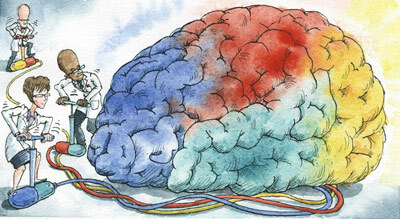 Crudely put, the brain’s neural networks can be thought of as electrical circuits. Neurotransmitters throw the switches. Cortex Pharmaceuticals, based in Irvine, California, is one firm that is developing ampakine drugs. One of its compounds, code-named CX717 to disguise its exact identity, is undergoing testing for Alzheimer’s disease in elderly patients. Early trials have already shown that the drug can make people more alert. Unlike caffeine, amphetamines and other stimulants, CX717 causes no increase in blood pressure or heart rate. Nor does it offer any “high”, so is unlikely to be addictive. Another approach to cognitive enhancement, says Dr Robbins, is through a neurotransmitter called acetylcholine. Cholinergic neurons—the name for those that respond to this molecule—are involved in concentration, focus and high-order thought processes, as well as memory. It is the cholinergic system that degenerates in Alzheimer’s disease. This entry was posted on Thursday, July 17th, 2008 at 10:54 am and is filed under Tech. You can follow any responses to this entry through the RSS 2.0 feed. You can leave a response, or trackback from your own site. The health care issue hits me the hardest with drug costs; My union has not been able to keep my CoPay as low as in the past so I have had to seek alternatives. One site I have been using is http://www.OPTIMIZERx.com . They have been helping me out finding me rebates, trial offers and the best thing is that it is totally free. Check it out we all need this kind of help today. A very insightful post on concentration exercises. Here’s a website that i thought i might share with you, which is very helpful on teaching you how to improve your concentration. It’s at http://www.attention-deficit-disorder.net. There are easy guides for you to follow too. Fantastic share here and I enjoy your take on things. One thing I’ve witnessed is what we think about is 100% what we attract. We create our own reality. Hi, i really know how it is to suffer from a problem like this. I have been struggling from this since a few years with the normal ups and downs so i really know to have a true problem like this. At a forum i found out some people were truly happy about a capsule they purchased of the internet and i also ordered it when i found those pills at – herbalhealingstore dot com -. So believe me, those herbals do work, you only have to get the good ones! All this information is most interesting, however are there any legal drugs or herbal solutions that actually work on poor memories ? After a very successful career in my 20’s 30’s I now find it impossibble to concentrate or remember facts. I am desperate to start learning again, but just find it impssoible to absorb and retain information. I can read pages of stuff, and then it all seems to just disappear from my memory !! HELP I would love any information. One of the supplements for memory is fish, not only for its iodine content, but also for the fatty acids found in the form of omega-3 oils. The fattier the fish the better. Tuna, salmon, mackerel and wild sardines rank high on the list of memory enhancing brain foods. Ginseng and gingko are the king and queen of natural memory enhancers. Both are ancient Chinese herbs used for centuries to boost memory and feed the brain. Ginseng helps balance and sustains proper hormone production in the body, improves memory and concentration and provides natural brain food. Ginko biloba aids increased circulation enhancing blood flow to the brain restoring memory skills and cognitive abilities.It’s also used as a memory enhancer and protective herb to forestall the signs of Alzheimer’s. It’s well known that antioxidants like vitamins C and E protect cells from damage by disarming free radicals. Brain cells are especially vulnerable to these troublemakers because the brain generates more free radicals per gram of tissue than any other organ. Antioxidants also protect neurons by keeping blood vessels supple and open, ensuring the flow of nutrients to the brain.